2.5 inches wide from seam to seam. 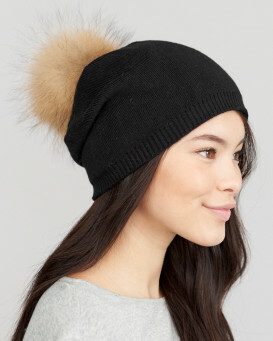 Add approximately 2 inches with fur extension. Bridget Black Wide Fox Fur Slap on Cuffs - Pair. So easy to wear. Just unroll, position on wrist and slap on. Take any sweater from your wardrobe and dress it up with these awesome slap on fox bracelets or wear them on bare skin. Great gift idea. Sold as a set of two. Available in a choice of colors. Measurement: 2.5 inches wide from seam to seam. Add approximately 2 inches with fur extension. 10.25 inches long. 4.5 / 5 from 51 customer reviews. "Wish I could post a picture of how I looked in my cuffs and collar, but I absolutely loved them. 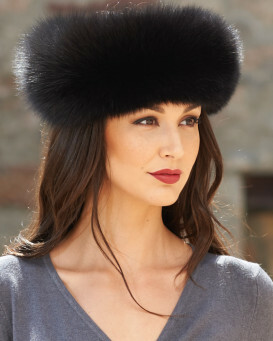 Will definitely be offering from this company again"
"Yet another winner from Fur Hat World. Beautifully made, fits the wrist perfectly and just the right touch to finish an outfit. Will be ordering the black fox cuffs soon. Never a disappointment when you order from FHW." "They're pretty cool. They attach to your wrist using the "slap bracelet" method. The fur is beautiful. I think they're going to be a lot of fun." "I purchased these in black as well And I love them just the same. Matching hat and head wrap and I am in love." "Very easy ordering process, great service, timely delivery. Beautiful product." "A bit expensive but they were what I was looking for! Among a few of my favourite things. Quick shipping and excellent customer service."